Koi often are kept in ornamental ponds. Koi and cichlids have much to recommend them. Keeping koi in ponds is a tradition going back hundreds of years. Cichlids display many fascinating behaviors. Each of these fish has numerous variations and color patterns available. However, they are largely incompatible for several reasons. The biggest thing that keeps cichlids and koi apart is temperature. Despite all of their diversity, cichlids are tropical fish. This means they prefer temperatures from at least the mid 70s up through the low 80s. Koi come from colder, temperate climates. They do not do well in water above 70 degrees. The differences may seem trivial, but fish cannot control their body temperature like mammals can, so it is critical that you keep them at the temperature to which they have adapted. Cichlids are a very diverse family of fish. However, many species are known for being very territorial, particularly when breeding. Since koi are rather docile, it would be very easy for a cichlid to harass, or even injure or kill a koi. While koi generally are not considered easygoing, they could eat smaller cichlids. In short, any cichlid too large to be a snack probably would be a threat to koi. In addition to temperature and aggression, most cichlids require different water chemistry from koi. 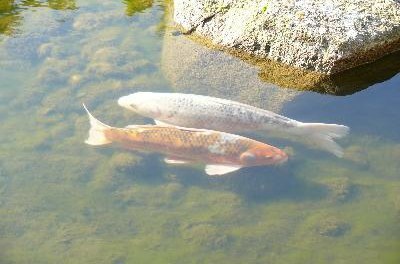 Koi generally come from neutral water (a pH of around 7). Since there are many kinds of cichlids, there is considerable variety in their water requirements. However, the famous African cichlids prefer water with a pH as high as 8.4, while some South America cichlids prefer acidic water in the ballpark of 5.5. These conditions are not compatible with each other, let alone with a koi. Lastly, koi usually are kept in ponds and cichlids are usually kept in aquariums. This particular issue is not set in stone; you can keep koi in very large fish tanks or keep cichlids in heated ponds. 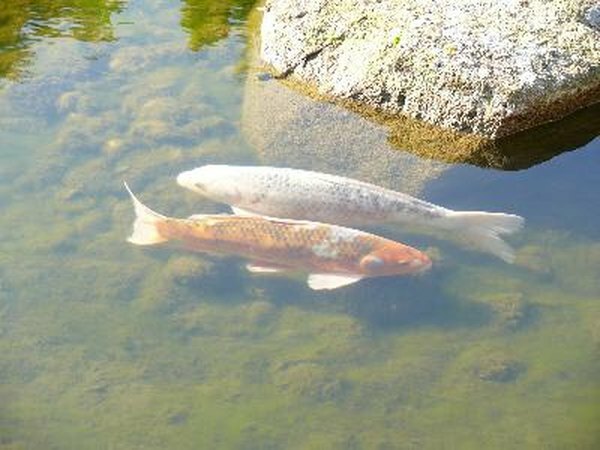 However, koi have been kept in garden ponds for centuries. They are well-adapted to it. Cichlids tend to do slightly better in an aquarium since the specifics of their water chemistry and temperature can be controlled more easily .